Promotional Ponchos - Develop Positive and Happy Customer Relations! 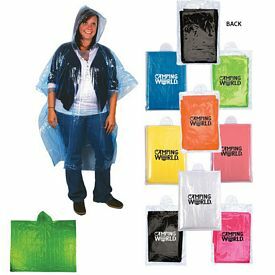 Customized ponchos are cheap and useful items that companies can use for advertising. If you want to make your next trade show a huge success, just giveaway something that catches your customers’ attention, like our custom ponchos! 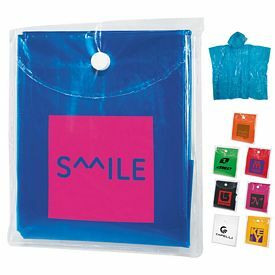 Promotional ponchos from The Executive Advertising are unique and helpful items that your customers will appreciate. 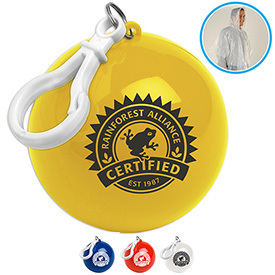 You can help protect your customers from rainstorms and bad weather conditions with these logo ponchos. 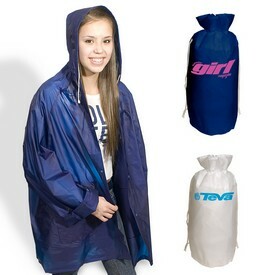 Imprinted ponchos are great items to hand out at outdoor sporting events, malls, tradeshows, and other places. People will definitely appreciate these personalized ponchos, especially at a time when they need them most! 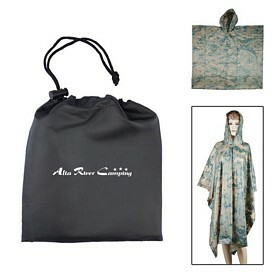 Most of our promotional ponchos are thin customized ponchos that are not meant for long-term use. 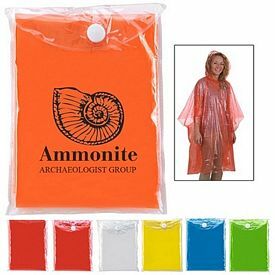 We offer logo ponchos in many different bright and attractive colors like yellow, blue, red, and so on. Your company information can be imprinted on the poncho’s packaging. Our customized ponchos also come with a free 1-color screen imprint. The custom Ponch-O Ponchos are one-sized hooded promotional ponchos that fit everyone. They come in a white case, which comes with a clip for easy attachment to a backpack or a belt loop. The main advantage of ordering these personalized ponchos is that the packaging is very interesting and unique. 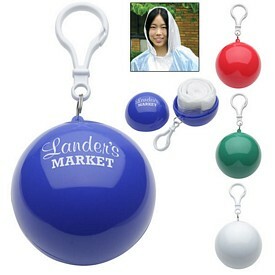 The poncho is fitted into a small keychain that can easily be carried around. 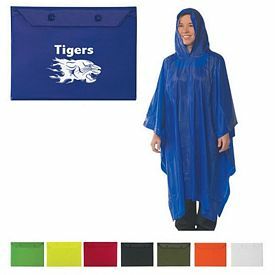 These custom ponchos are perfect for sporting events and outdoor promotions. Personalized ponchos as great for promotional handouts, and they will bring your company a lot of attention and recognition. It is easy and hassle-free to stock up on these lightweight promo products, so start ordering, and be prepared for your next promotional event! Our imprinted ponchos are very affordable products that can be used by companies of all sizes. 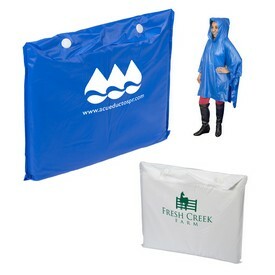 If you are ready to take your promotional investment to the next level, we have multi-utility ponchos as well. The promotional Giftcor Rain Poncho and Backpack Set is a backpack and rain jacket combo. The rain jacket has hand pockets and can fold up into its zippered collar when you are done with it. The backpacks looks nice, and it can be used separately. The straps are adjustable and people can carry the custom backpacks quite comfortably. Our personalized ponchos are promo products that all kinds of people will love to receive! Both adults and kids, male and female, will want protection from sudden rain showers. These are universal items that can be very effective in marketing your company. We will do our best to make sure that your customized ponchos arrive on time. We do not charge any setup fees on our products, and we also provide various free production rush offers. Browse through our online catalogs to know more about our custom ponchos. Order our logo ponchos today!